Jay Stevens takes us out to the ballgame. 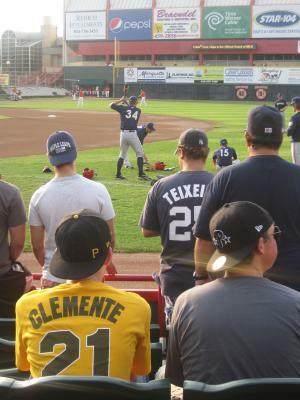 And more importantly, he gets the chance to see the most talked about major league prospect take the field at the Uht, a guy from the other team. 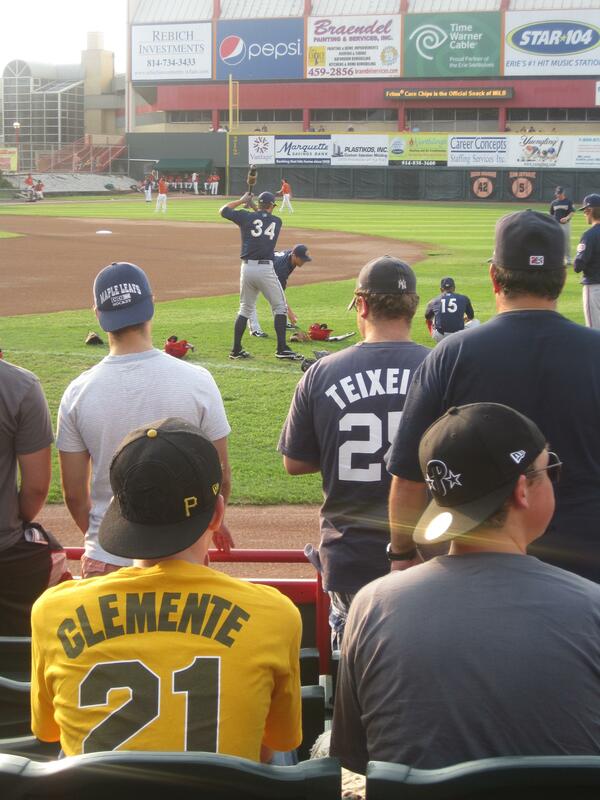 Bryce Harper Weekend at Jerry Uht park started under a cloud. The SeaWolves had marketed around the 18-year-old slugger, and for good reason: baseball's number-one prospect has enormous talent, the kind that earns you a Sports Illustrated cover when you're 16, that gets you selected as the first overall draft pick in 2010 with its accompanying $9.9-million bonus, and that propels you to AA ball at an unheard-of age of 18. But the pregame presser with Harper was pushed to Saturday, then canceled, Harper rumored to be "weary" of the media circus that followed the youngest Harrisburg Senator through the Eastern League. Harper's relationship with the media was already strained: he blew an opposing pitcher a kiss in an A-ball game after homering, and the press corps rushed to question his judgment, character, and his fitness for the star treatment they created for him. Now access was cut off. Done. But the worst cut was yet to come. The Harrisburg Senators arrived late, and there would be no batting practice. That meant no chance to witness Harper's famous displays of home-run power during his cuts in the cage. That also meant the writers were left without stories and the Erie club with egg on its face for having thrown open the gates early for fans who wanted to see the kid hit. When the visiting team finally does arrive, a throng of sullen fans gather in the first-base stands and study Harper as he pretends during his warmups not to notice them. Things had gotten out of hand. Blame the media. Blame the Internet for blowing up the story with its nonstop coverage. Blame the cameras and camcorders that – even now! – record his every move, every leg kick and practice swing. The hype that had swollen to Ruth-ian proportions has come crashing down to this awkward moment of a crowd of hundreds gathered to watch an embarrassed teenager stretch his groin. But then a funny thing happened. There was a baseball game. A good, lively game, too, which the home team won before a packed house, 5 – 1, and whose hero wasn't the bonus baby from the other team, but a newly promoted beanpole lefty named Drew Smyly who baffled Harrisburg hitters over five innings with a sweeping curve and cutter that broke in on the hands of right-handed batters. The Bryce Harper carnival may have stumbled, but, as Erie manager Chris Cron said about the new addition to his staff, "the kid knows how to pitch. He had a real nice presence out there, and it's fun to watch him pitch." There's a lesson for us there, isn't there? A game – any one game – can teach you a lot, if you know enough to look. So. Here's what I learned about Bryce Harper tonight. In the third, after a Brandon Douglas triple and a walk each to Bryan Holaday and Brent Wyatt, the SeaWolves loaded the bases. The next batter, center fielder Jamie Johnson, promptly knocked a high fly to left, to Bryce Harper. Douglas tagged, and scooted home, when Harper uncorked a throw home – a bullet! – a throw that was fast and straight, if offline, but that made the crowd gasp. Subsequently Erie runners held at third on balls hit to left. Bryce Harper has a cannon for an arm. In the fourth, Smyly induced Harper to hit a grounder to shortstop. The ball was off to Gustavo Nunez' side, and Harper raced breakneck down the line, sliding into first head-first. He was out. Later, in the eighth and with his team down by four, Harper showed bunt, trying to get on base any way he could. Bryce Harper will not be a player who loafs. The kid plays hard. On the other hand, he needs to show more in-game judgment. No one, especially not the future of a franchise, should slide into first base, with its chance for serious injury. And Bryce Harper should never bunt. In the second, Harper scorched a screaming liner off Symly's thigh ("nicked it" says Smyly later) for a single. He took off for second, but teammate Adam Fox hit a long foul, and Harper had to retreat back to first. Smyly threw the next pitch into the dirt, and Harper was off. Erie catcher Bryan Holaday picked the ball up, rushed the throw, and sent it high and wide and into center. Harper advanced to third on the play, coming home on a Leonard Davis groundball to second. Bryce Harper has speed and is an aggressive baserunner. Perhaps too aggressive: his athleticism allowed him to take the extra bases on the AA catcher, but a major-league catcher probably would've had him by five feet at second. There's talent here, real talent, visible even in these busted plays, these ground outs and fly balls. It's rough. It needs refinement. He needs to learn to deal with breaking balls. He needs to know when to rein himself in. He needs to know how to deal with the pressure his talent places on him. Yes. But the talent is real. "The kid is a special player," says Cron, "when most of us were 18 we were hanging out in high school, jumping in swimming pools, we weren't playing in double-A ball. "The hype is the hype. We've just got to live with it."